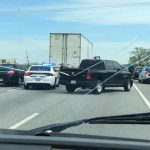 We are awaiting more details, but we know that federal, state, and local enforcement officials were all involved in a traffic stop of a tractor trailer late this morning on Interstate 581 right at the Elm Avenue exit in downtown Roanoke. The driver was seen emerging with his hands raised. For a while, the stop closed all northbound lanes of the highway. The U.S. Marshal’s office says the action was taken after receiving a tip from a law enforcement agency in eastern Virginia that a fugitive from justice was spotted heading for Roanoke.